Law360 (January 31, 2019, 10:04 PM EST) -- Firms with offices in Delaware filed the most patent lawsuits in 2018, with that state seeing an influx of cases after a blockbuster U.S. Supreme Court ruling, while a pair of IP boutiques topped the list of firms fielding a high volume of work at the Patent Trial and Appeal Board. Stamoulis & Weinblatt LLC, a law firm in Wilmington, Delaware, led plaintiff representation in district court with 238 cases. Closely behind was the Devlin Law Firm LLC, with 209 cases, according to a new year-in-review report from Lex Machina. Neither Stamoulis & Weinblatt nor the Devlin Law Firm is in unfamiliar territory. Both have been a consistent presence on lists of the most active firms for patent plaintiffs over the past couple of years, thanks to what firm leaders say is a mix of work as both lead and local counsel. Timothy Devlin, the managing partner at Devlin Law Firm, said, for example, that his firm was Delaware counsel in more than 60 percent of cases it filed in 2018, with other firms acting as lead counsel in those cases. Much of that work has come out of the Supreme Court’s blockbuster 2017 ruling in TC Heartland v. Kraft Foods, which shook up the landscape of patent litigation by holding patent suits can only be filed where defendants are incorporated or have a place of business. More cases are being filed in Delaware, where a number of businesses are incorporated. “Our lead counsel work has expanded as the firm has grown, but after the TC Heartland case, the firm made a decision to take on a significantly greater amount of Delaware counsel practice than we ever had before,” Devlin said. 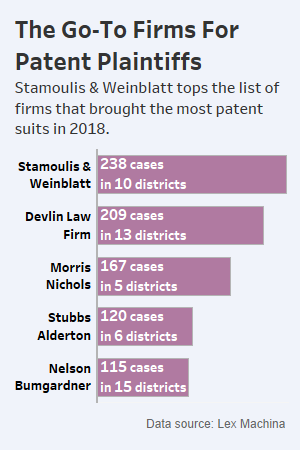 Morris Nichols Arsht & Tunnell LLP, another Delaware-based law firm, was the third most active on the plaintiff’s side, representing plaintiffs in 167 new patent cases. Much of that work involved representing brand-name drug companies in infringement litigation against generic makers. Morris Nichols was also among the busiest law firms in terms of defending companies in patent infringement lawsuits. Karen Jacobs, coordinator of the firm’s IP litigation group, said the volume of cases speaks to the firm’s experience and deep bench. “We’re able to handle lead counsel, co-counsel and Delaware counsel cases, and that gives our clients a variety of options as well,” she said. On average, the 21 law firms on Lex Machina’s list of plaintiffs firms filed cases in approximately 11 districts around the country. Only three — Finnegan Henderson Farabow Garrett & Dunner LLP, Venable LLP and Fish & Richardson PC — appeared in more than 20 districts, highlighting their national reach. Venable’s workload for patent owners — 67 new cases in 2018 — includes lawsuits filed by Fitzpatrick Cella Harper & Scinto, with which it merged in November. Dominick Conde, co-chair of Venable's IP division, said the numbers illustrate the strength of the IP groups from both firms. On the defense side, Fish & Richardson led the way as it represented accused infringers in 155 patent cases. Morris Nichols was the only other firm to top the 100 mark. 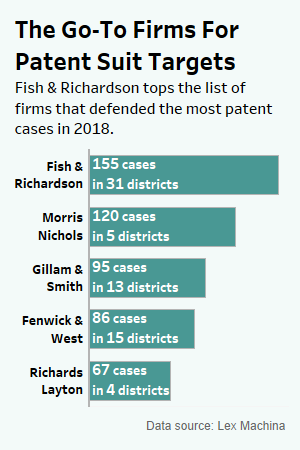 This lofty position is nothing new for Fish & Richardson, which has dominated the patent defense rankings in recent years. Kurt Glitzenstein, leader of the firm's litigation practice group, attributed this consistency to the expertise of the firm's lawyers and their experience — not just in district court, but also at the Federal Circuit, the U.S. International Trade Commission, and the Patent Trial and Appeal Board. “It’s that continual experience that really builds trust in clients, not only to hire us for their matters but also to see them through to the end if that’s what is required in the case,” he said. That experience is reflected in the rankings at the PTAB. 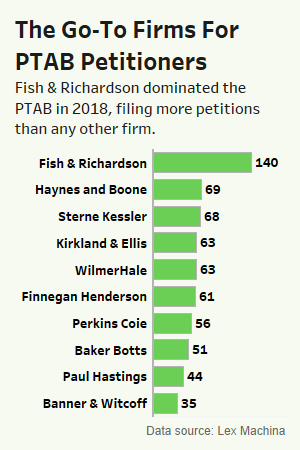 Fish & Richardson ran away with the title as most active firm for companies bringing patent challenges at the PTAB, filing 140 new petitions in 2018, according to Lex Machina. Being active in both the district court and the PTAB allows the firm to have a full discussion with clients "about what the options are and how things are likely to play out in the PTAB if that does become a component of the strategy, either offensive or defensive," he said. 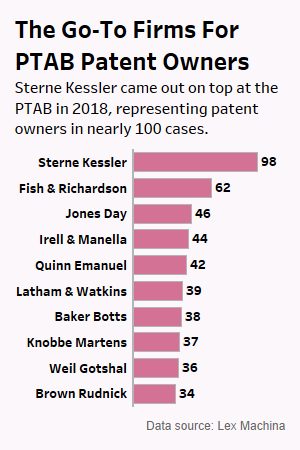 The only law firm that represented more patent owners than Fish & Richardson in proceedings at the PTAB was Sterne Kessler Goldstein & Fox PLLC, which handled 98 cases. Sterne Kessler, an IP-focused firm in Washington, D.C., was also the third most active law firm for petitioners. Michael Specht, co-chair of the Patent Office Litigation Practice at Sterne Kessler, said the firm quickly recognized the importance of proceedings created by the 2011 America Invents Act, which allowed the firm to position itself as an early leader in that space. The PTAB remains a strategic focus for the firm. --Editing by Pamela Wilkinson and John Campbell. Law360 is owned by LexisNexis Legal & Professional, a RELX Group company, which owns Lex Machina.